It's finished! I began this in February and just finished it late last week. What's more, it fits! Amazing. I loved making this sweater. I'll admit it was a little nerve wracking doing the bodice as I had to make several adjustments. It was enjoyable to knit and such a bump to my ego that it fit! Well, it didn't fit perfectly at first, there was too much length at the shoulders but that was an easy fix as I figured it out when pinning it all together for a test fitting. I'm particularly amazed that I got the sleeve caps the first time through. It's been decades since I made a sweater. 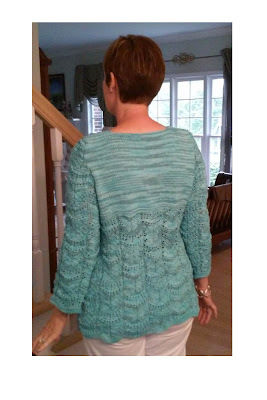 The pattern was on Ravelry.com. 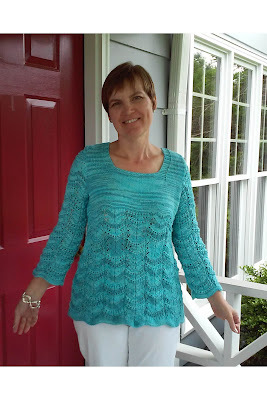 It is this one called Wavy Lace Tunic. by Gayle Bunn There are 28 rows in the pattern and I don't think I ever completely memorized them. The yarn is from a local shop and it is from Sunseeker. It has a little silver metalic thread running through the variegated turquoise color. I am now officially spoiled on good quality yarn. When I was knitting in my teens and 20's I suppose there was better quality yarn than acrylic worsted and baby weight available somewhere but I didn't have access or money to buy any. There was a 5 and Dime store where I bought my yarn. I'm pleased though that I also bought my Susan Bates needles there and have kept them all these years. They are still my favorites. The yarn is DK weight, smaller than the pattern called for so I had to make quite a few adjustments. I decided on a square neckline so I could make the garter stitch finishing as I went along. This is probably far more than you ever wanted to know about my sweater so onto the layout. wow - you are multi-talented!! It's a gorgeous top (such a pretty colour) and I love your page too!